The Halloween Houdini Seance and seance show Internet information Oct 30-Oct 31. Our psychic paranormalist presentation, "Haunted! Mind Mysteries & THE Beyond." Our yealy famous Halloween Harry Houdini seance tribute both by invitation at our facility, and on the web,Ê we are asking everyone to attempt to contact Harry Houdini sometime during Halloween for the 24 hours of October 31st and email us with any results and lack of results. No kooks please, this is a serious Halloween test and tribute. Ê Chosen as one of the "7 Wonders of the Web"
Here is her original release when she was preparing to do the seance. 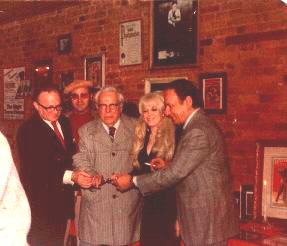 The photo shows some of Magic's most famous figures at a New York "Halloween Harry Houdini Seance." 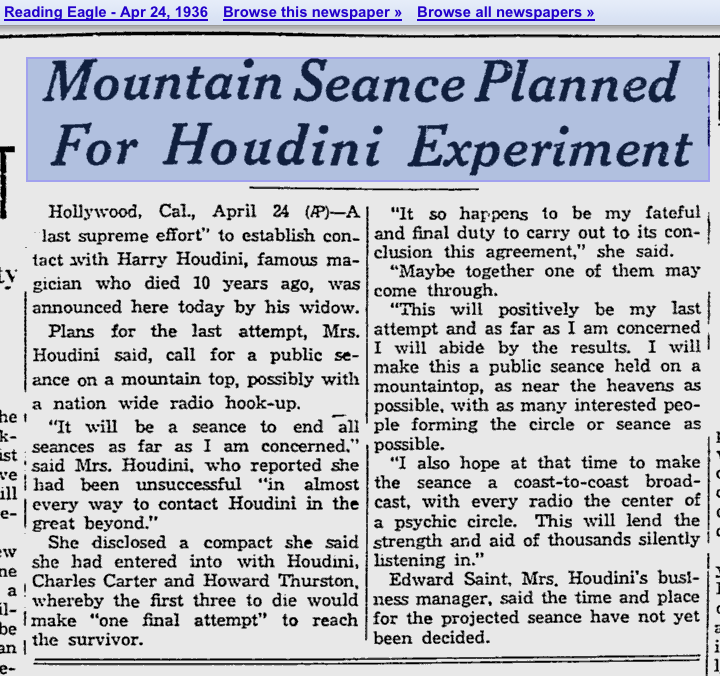 Although these have been called "seances" by many, it was really meant as a scientific test between Harry Houdini, his wife Bess Houdini and friends. 1) Magic author and editorÊ Byron Wells. 3) Famous author Walter B. Gibson, author of "The Shadow," Harry Houdini biographer, ghost writer, confidant of Harry Houdini and his wife Bess Houdini. Before he died he asked Dorothy Dietrich to carry on the tradition of the Halloween yearly Seancetributes toÊ Harry HoudiniÊ called by manyÊ "seances." 4) America's leading female magician and anÊ expert on Houdini, Dorothy Dietrich. 5) Milbourne Christopher, magic historian, and biographer of Houdini who attended most of theÊ New York "Halloween Harry Houdini Seances" at The Magic Towne House before he passed away. at another of our "Halloween Harry Houdini Seances" shortly before he passed away. Please note the NYC Mayor's Halloween Magic Week proclamation above Walter and Dorothy's head. ÊHarry Houdini never said he was coming back, or that he would open handcuffs, etc. Harry Houdini was the exposer of the very people who claimed they could get messages from your dead relatives, make their ghosts appear, etc. Harry HoudiniÊ said such things were in his experience not possible, but being the greatest escape artist/magician that ever lived he, Harry Houdini, would try to escape from the beyond. After ten years of no results during any of thee Halloween Harry Houdini seances,his wife Bess Houdini sent out a letter to participants saying "since the failure of the ten year TEST, it is my opinion that all concerned have struck a mighty world wide blow at superstition." That was her final Halloween Harry Houdini seance. Go to Articles about past "Halloween Harry Houdini Seances"
Not well known facts about Harry Houdini. Some Harry Houdini challenges in the area. Harry Houdini's exposure of psychics, mediums and other frauds. Local writer writes of seeing Harry Houdini many times. Ads for Harry Houdini's movies in Scranton. Some Harry Houdini portraits, drawings, etc. About the Harry Houdini museum and tour. To order a Harry T-Shirt. Go toÊ Pocono - Scranton Fun Guide. Go toÊ SCRANTON HISTORY. Historic Jewel of the Pocono Region. Go toÊ Early theater history in Scranton. Go toÊ List of over 200 Pocono Scranton area hotels and restaurants listed by area and town. © 1993-2005 Êby The Houdini Museum. No part of any of this document may be reproduced in any form, without written permission.Ê The graphics have been retouched, computer enhanced and resized by the authors. Pull Down - Harry HOUDINI PAGES Biography-Harry Houdini AREA'S BEST MAGICIANS PAGE plus magician Harry Houdini riding trains. Harry Houdini Grave Site Harry Houdini Interesting Facts Historic Harry Houdini Local Appearances Harry HoudiniÊ Graphics Hardeen, Harry HoudiniÊ brother. Mediums & Fakes Harry HoudiniÊ exposed Local writer saw Harry HoudiniÊ Harry Houdini ! Movie Star OurÊ Halloween Harry Houdini Seances Halloween Harry Houdini Seances on the Internet Halloween Magic Shows Dunninger's Fake Claims Harry Houdini Souvenirs Harry Houdini T-Shirts - Collectable Harry Houdini Posters (some for sale) Harry Houdini Souvenir Order Form Harry Houdini Recent Acquisitions Scranton Theater History You can link to us Harry HoudiniÊ The room where Harry HoudiniÊ died on Halloween. Famous Harry Houdini Scranton Challenges Harry Houdini Movie - "Man From Beyond" Harry Houdini Movies Great new book, "Houdini"
This web site includes Houdini's biography, Houdini's tricks, Houdini's death, Houdini quotes, the Houdini movies or Houdini movies, our Houdini Inc., Houdini's real last name, and Houdini's magic,the Halloween Houdini seances,etc. © 1993 - by magicusa. Except for reviews, no part of any of this document may be reproduced in any form, without written permission by the authors.Ê The graphics have been retouched, computer enhanced and resized by the authors. Here is our email address.Ê We are more likely to get it if you put the subject in Caps.